I could not be more proud of the outstanding performance that Lauren Wells, Will Clark, Dan Selinger, and Melvin Lima gave to a sold-out audience at the Vineyard Theatre tonight. It was my deepest privilege to work with this incredible cast & crew! Festival week is finally here! Had a blast tonight at the kick-off party at the Samuel French offices. There are still tickets left for our night - August 24th at 7 p.m. Grab a ticket and come see us! 3 Weeks Until the Samuel French Short Play Festival! 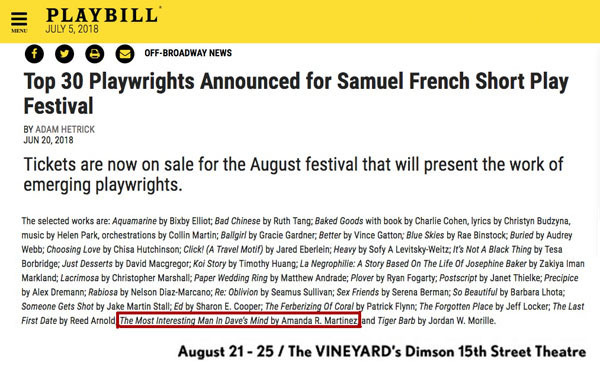 Three weeks from tonight at 7 p.m. sharp, we'll be performing my short play, "The Most Interesting Man in Dave's Mind" as part of the Samuel French Festival at the Vineyard Theatre. The show, directed by Brandt Adams, stars Will Clark, Melvin Lima, Dan Selinger, and Lauren Wells. We're so excited to bring this crazy little piece to you. Grab a ticket and come see us! 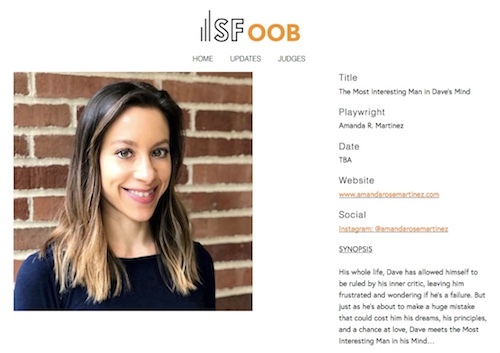 "The Most Interesting Man in Dave's Mind," a Finalist in Berlin! 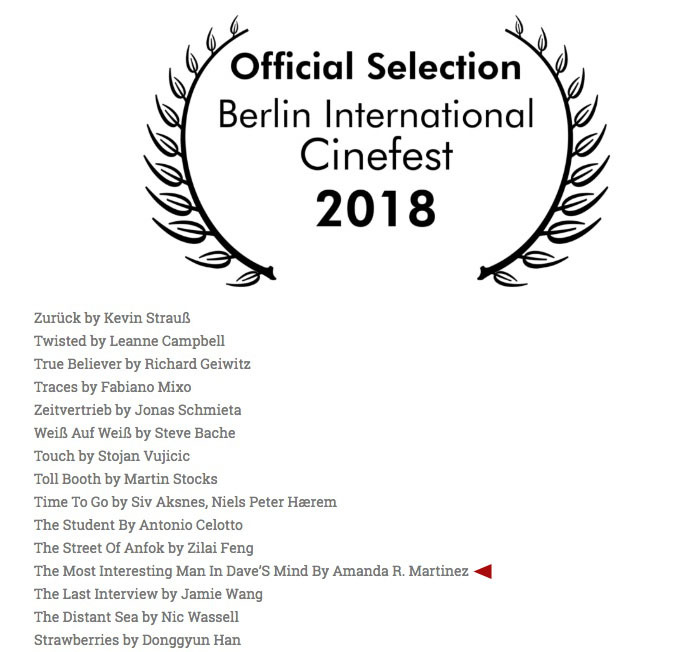 My script "The Most Interesting Man in Dave's Mind" was named a finalist in the 2018 Berlin International Cinefest screenplay competition! Tickets are on sale for the Samuel French Short Play Fest, where my piece "The Most Interesting Man in Dave's Mind" is a finalist. 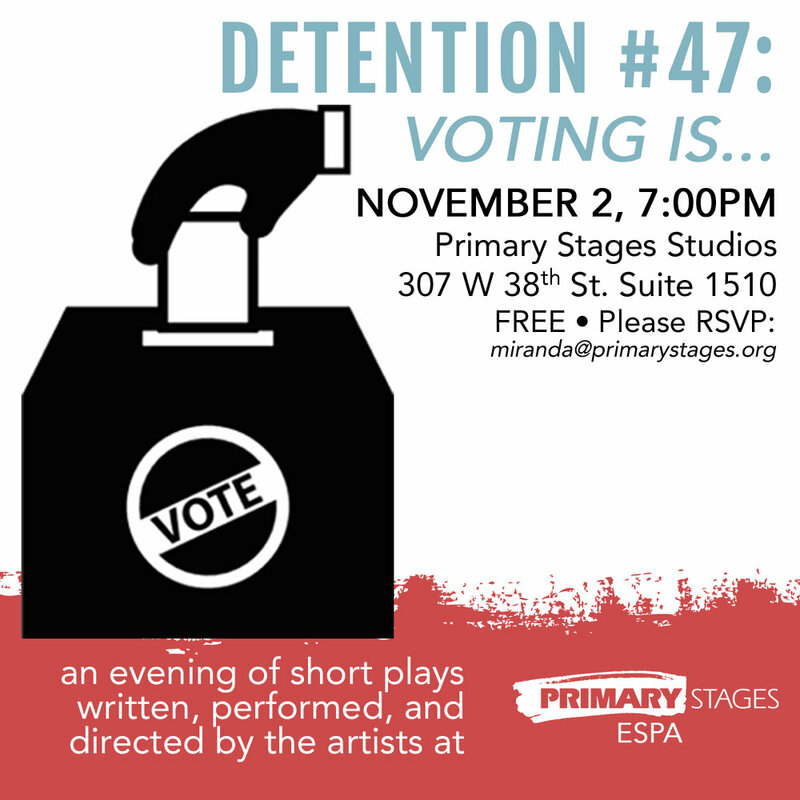 We're performing Friday night, August 24 at the Vineyard Theatre, the brilliant Brandt Adams of The Nerve Tank and Sea Dog Theater is directing, we've got a killer cast, it's a comedy - come cheer us on! Buy tickets here! A Finalist in the 2018 Samuel French Short Play Festival! Incredible news! My short play "The Most Interesting Man in Dave's Mind" was named a finalist for the upcoming Samuel French 43rd Annual Off Off Broadway Short Play Festival. It will be performed at the fest, August 24, 2018, at the Vineyard Theatre in NYC. Check out the play's origin story on the Sam French OOB Festival site! 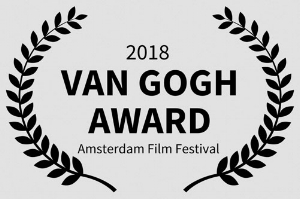 So excited and honored to learn that my short script "The Most Interesting Man in Dave's Mind" won a Van Gogh Award as an official finalist at this year's Amsterdam International Film Festival! Official Poster for "Steady the Pour"
The movie poster for Steady the Pour, a short satirical comedy I wrote, is here! What's your spirit animal? My short script "Minority Hire," a satirical comedy about the unintended consequences of a fully automated workforce, was named a finalist by this year's Hollywood Comedy Shorts Film Festival! The fest takes place April 20 - 22 at the historic Chinese Theatre in Los Angeles, CA. 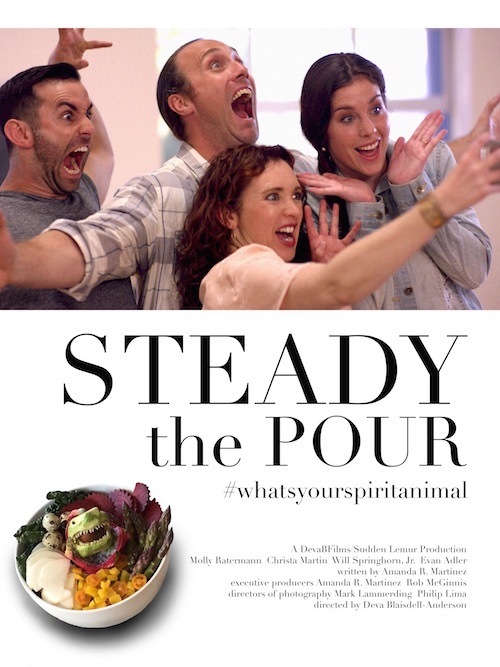 Post Production for "steady the pour" is Finished! Post Production for Steady the Pour, a short film I wrote that was filmed in Santa Cruz, California last summer is finished! Now to find out if the festival circuit has an appetite for existentialist satire... Here are some behind-the-scenes shots. Set photography courtesy of Mama-T.com & Rob McGinnis. My script "The Most Interesting Man in Dave's Mind" wins its 5th set of laurels! 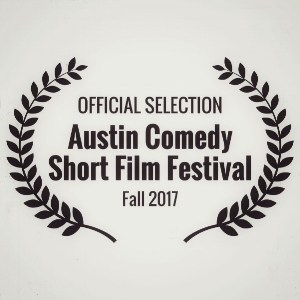 It was named a finalist in the category "Best Short Comedy Screenplay" by the 2018 Houston Comedy Film Festival. Check out the awesome write-up the fest did about my screenplay here! 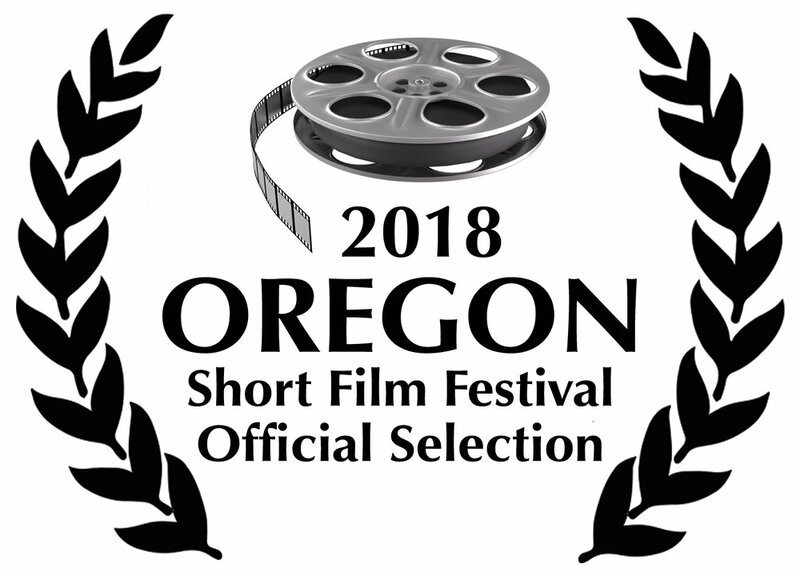 Another win for my short screenplay "The Most Interesting Man in Dave's Mind" at the Portland Comedy Film Festival on March 24 at the Avalon Theatre in Portland, OR. Here I am with fest director Mikel Fair. Such an honor to be recognized!